Sister Barbara Anne Brady, I.H.M. 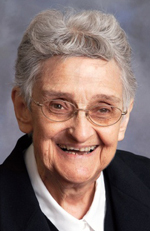 Sister Barbara Anne Brady, I.H.M., died March 19 in Camilla Hall, Immaculata, in the 62nd year of her religious life. She was 82 years old. Born in Philadelphia, Sister Barbara Anne entered the Congregation of the Sisters, Servants of the Immaculate Heart of Mary in 1952 from St. Paul Parish, Stone Harbor, N.J., and professed her vows in 1955. At the reception of her habit, she was given the name Sister Mary Justin. She later resumed use of her baptismal name, Barbara Anne. She taught in grade schools in the Archdioceses of Philadelphia and Miami, and the Dioceses of Harrisburg, Arlington, Camden, San Jose and Norfolk. In the last eight years while living and assisting at Villa Maria House of Studies, she worked as an aide in Villa Maria Academy. She retired to Camilla Hall in August 2013. The funeral Mass was celebrated March 24 at Camilla Hall. The celebrant and homilist was Father William E. Dean. She is survived by members of her religious community; her sister, Molly Dunn; nieces, nephews, grandnieces and grandnephews. She was predeceased by her parents, John and Anna Imms Brady, and siblings John, Stephen and Patricia Weaver.